Yesterday I gave you guys my favorite recipe for simple egg pasta dough. 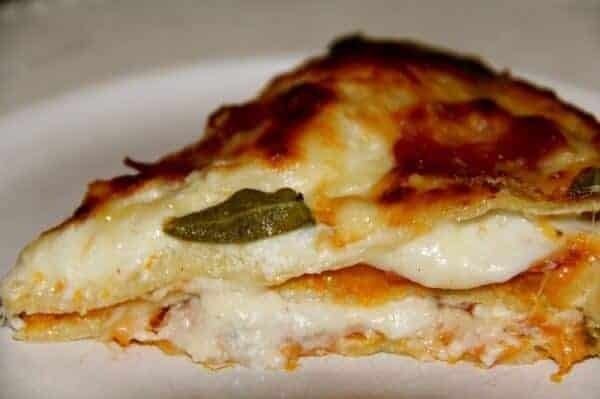 Today I want to share one of my favorite ways to use that dough – Lasagna! Typically I like to do a traditional lasagna with tomato sauce and meat, one because it is a huge hit and two because EVERYONE will eat it. Which means I do not have to make two separate meals (some of the boys are pretty picky, but getting better) YES! I used my favorites fall vegetable and put it in a lasagna and it is so good! Like I mean seriously good. Cheesy squash and fresh homemade noodles baked to perfection. Roasting squash really brings out its flavors. 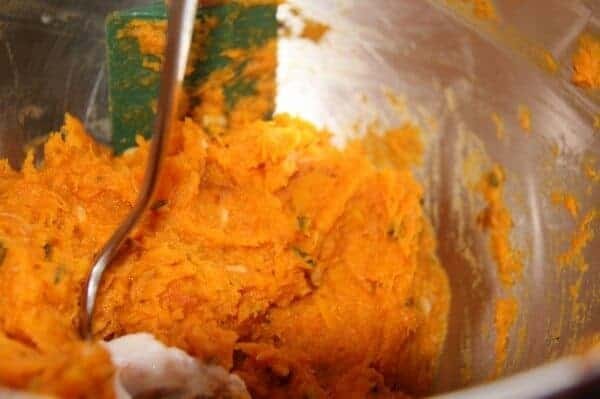 As a side dish for another meal, I will simply cut the squash (any variety) into half moons and roast it up with a little sprinkle of pumpkin pie spice. SO GOOD. For this dish, I first roasted the squash alongside some garlic and then mashed them together with some butter and sage. Sorry I am also addicted to sage lately as well! 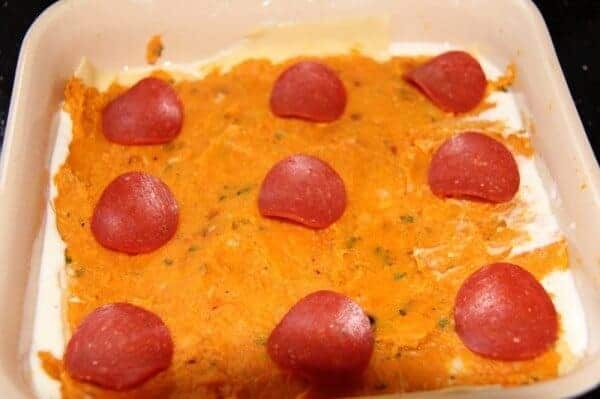 Add your béchamel sauce, pasta, some pepperoni, some more sprinkles of cheese and some fresh sage leaves to top it off and you are ready to go. If you can, I would go with fresh pasta, it really does make such a difference. It is almost like the pasta melts in your mouth. The sage leaves get all crispy and delicious in the oven and the dish comes out looking beautiful. 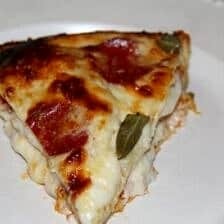 This would be great to serve for a dinner party, it can feed a crowd and can easily be made vegetarian by eliminating the pepperoni. I actually divided the dish into two Pyrex pans and froze one 8×8 lasagna. So excited to have this in the freezer, it will be great to pull out for a quick comforting dinner! If you are going to take the time to roast the squash, I would highly recommend either doubling the recipe or splitting the dish into two smaller lasagnas and stashing one in the freezer for a cold winter night. Double duty cooking is the best. Cheesy squash and fresh homemade noodles baked to perfection. 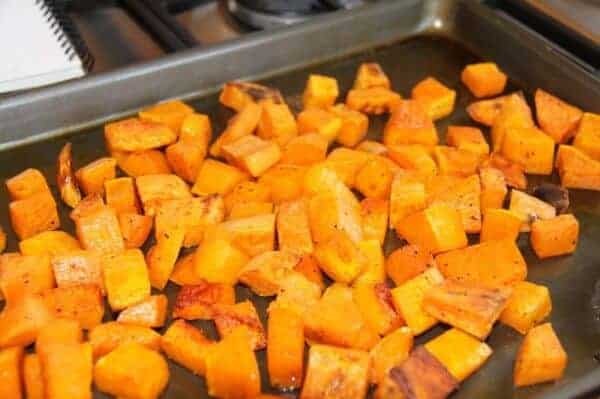 For squash and garlic: Lay cubed squash on a baking sheet, and drizzle with a bit of olive oil (only about 1-2 teaspoons). Use your hands to coat the squash with olive oil, then sprinkle with ½ teaspoon each of salt and pepper. Wrap the 6 cloves of garlic in tin foil and drizzle with ½ tsp olive, salt and pepper, place on baking sheet with squash. Roast for 50 minutes, tossing every 15 minutes or so. Remove from oven and sprinkle the squash with the chopped sage. Transfer to a bowl and either mash with a fork or whip them with a mixer. Take the roasted garlic and squeeze the garlic out of if it skins, mash with a fork and combine with the 5 tablespoons of butter. Mix the roasted garlic butter with the squash, making sure the filling is spreadable. Béchamel: Melt the butter in a medium saucepan, add the flour, and whisk until smooth. Cook over medium heat, stirring regularly, until the mixture turns golden brown, about 6 to 7 minutes. Add the milk to the butter mixture, 1 cup at a time, whisking continuously until the sauce is very smooth. Bring to a boil and cook for 30 seconds longer. Remove from the heat and season with salt and nutmeg. Stir in the mascarpone, ½ cup of mozzarella and the ½ cup of Parmesan, whisking until all the cheese is melted and smooth. Assembly: Preheat the oven to 375 degrees. 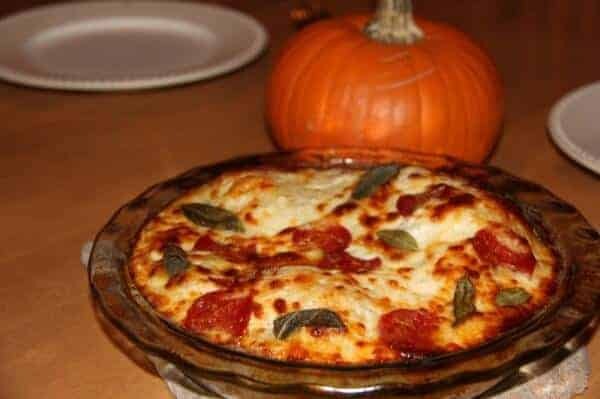 Brush a 9-by-13-inch glass baking dish with melted butter or oil, and layer in the following order from the bottom: béchamel (saving about 1 cup béchamel for last topping), pasta, squash filling, pepperonis and sprinkle with a third of the reaming cheese. Repeat, making 3-4 layers of pasta. I like the very top layer to be just the béchamel, cheese, and pepperonis. Then if desired top with 6-8 whole Sage leaves, they with get brown and crispy in the oven. Cover with foil and bake in the oven for 45 minutes, until the top is golden brown and the casserole is bubbling. Remove from the oven, allow to cool for 20 minutes, slice, and serve. * I recommend using fresh pasta, but no boil or boiled store bought pasta will work great to. 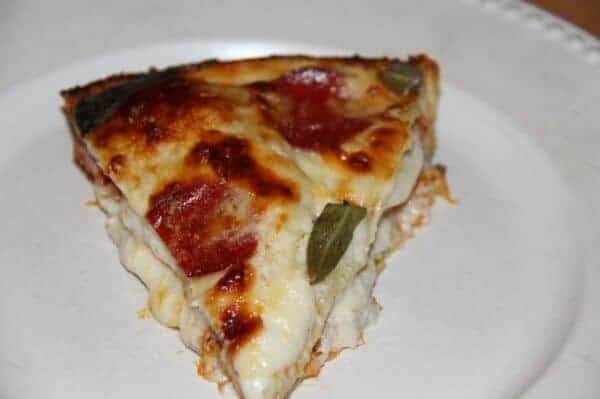 *If you can not find Mascarpone Cheese you can sub more mozzarella or parmesan, but if you have it around a nice creamy provolone would be great. *TO MAKE AHEAD: Fully assemble the Lasagna and cover with foil. 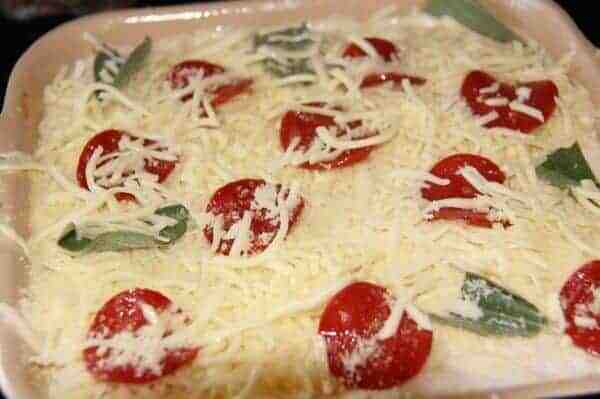 Place in the fridge until ready to bake. Well the oven is pre-heating remove the lasagna and allow to come to room temperature. Bake as directed. *TO FREEZE: Assemble the lasagna and cover with plastic wrap and then cover with foil. Make sure to cover as tightly as you can and if your Pyrex dish a top put this on as well. Place in the freezer up to six months. When ready to bake remove from the freezer to defrost either in the fridge over night or on the counter for a few hours. Remove plastic wrap and cover with foil. Bake as directed. Light some candles and Enjoy! Simple Caramelized Butternut Squash and Kale Florentine Lasagna. 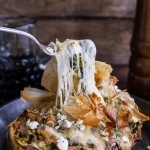 Spanakopita Stuffed Spaghetti Squash Bowls. Oh wow, this looks SO GOOD! Butternut squash really does go excellently in lasagna, and I bet your homemade pasta really made this dish top the charts! YUM! I made my first butternut squash lasagna recently with a white sauce. It was pretty good, too! 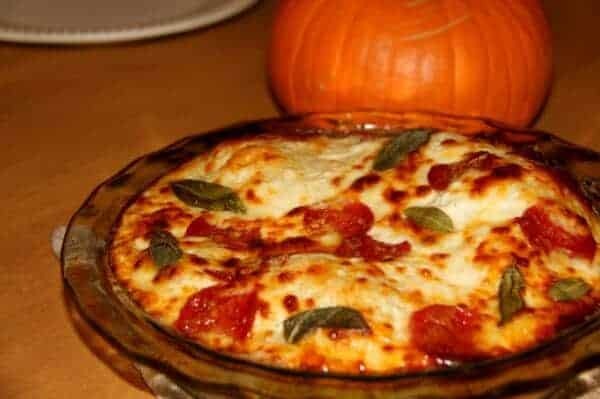 Your lasagna looks amazing! Love butternut squash! 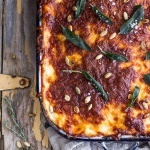 Wow, never thought of using butternut squash in a lasagna! It’s always been in sweet pie form for us, but this looks so good we may give it a try! What a fabulous use for butternut squash. Pinned! thanks so much for linking on Busy Monday! Wow! That does look awesome!!!! 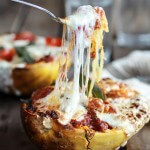 I really need to try butternut squash now…especially since this is covered in lots of cheese!!! Do you cook the pasta first or put the fresh dough with out cooking? Double-check the instructions and ingredients on this recipe. Instructions indicate that there are potatoes, but the ingredient list does not. 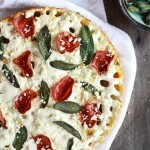 Can you substitute the pepperoni for something to make it vegetarian or just do without?